Duwayne Burnside was born in the late sixties in Coldwater, Mississippi and grew up hearing his father, R.L. Burnside, and family, as well as neighbors play music; guitar driven Mississippi Hill Country Blues. Along with his family and neighbors, the radio was another influence on Duwayne’s evolving style. He picked up the guitar before he was old enough to hold it himself. Duwayne was also playing in R.L. Burnside’s family band Sound Machine Groove, which combined the hill country sound with the soul and R&B that was pouring out of Memphis at the time. 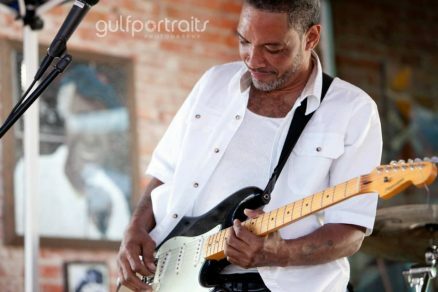 Between the two styles and his growing experience, Duwayne became an outstanding rhythm player with the ability to blend with all styles of music and any musician. While playing rhythm Duwayne was also paying attention to all other parts being played, and stepped up to fit in anywhere he was needed whether it was drums, bass or guitar. Duwayne’s leads began to undeniably sound fuse with Albert King and the heavy soul feel that came from earlier playing experiences. In mid 1998, Duwayne traveled to Los Angeles, California to record his first full length record Live at the Mint as Duwayne Burnside and the Mississippi Mafia. Members included Cedric Burnside, Eddie Batos, Joe Hill from Alien Ant Farm, and David Kimbrough, with Duwayne’s father R.L. sitting in on a few choice tracks.